It's only recently that I started to write down any sort of directions for pieces that I've made. The whole time having the store friends and customers alike would ask me to write patterns for what I was making. Like a sullen kid who had to get homework done for Monday morning I fought it. I would tell them, "consider them giant swatches for you to see the yarn", so lame! And again like that sullen kid once I started doing it I discovered it wasn't so bad, in fact I really enjoy the challenge of trying to translate my chicken scratch notes into an actual pattern. Now that I don't have the store and have more time to give to my knitting "career" (let's see 24hrs in a day, minus 13 hours of child chasing, minus an hour or so to catch up on the day with the hubby, oh and sleep minus 6-7 hours for that, ok so maybe 3 hours a night for knitting barring any interruptions from the geriatric dog or the should be sleeping children) I'm going through about 5 years of garments I've designed for store displays, photographing them and deciding which ones I want to revisit. Some of the pieces I don't have any notes on, others almost completed patterns but I'll post periodically as I sort through maybe seeing it "out there" will help me decide. I was inspired to make this vest after seeing my oldest daughter wear one of her winter vests upside down. It created this wonderfully wide collar. I really wanted to put in a zipper to make the collar stand up showing it off better and I still might, but for the photograph I settled for using a single button. I don't have any notes on this vest although the construction was fairly easy. 2 skeins of Magnum & #19's It shouldn't be a hard pattern to write. This is a pattern I'm currently working on. I'll have 2 versions. This one with the long sleeves and lots of collar; and a more scaled down version with 3/4 length sleeves and less of a collar. 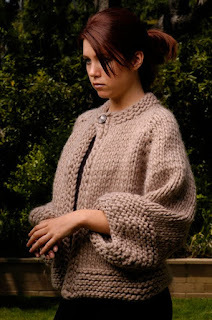 The one pictured here was made using a yarn called Fusion by Madil that has since been discontinued, so disappointing because it was the perfect mohair/merino/acrylic blend. Very lofty and soft. An aran weight yarn for a #9 needle although on this I used #11 & 13's. It created the perfect drape. I think I've found a good substitute though in Cascade's 100% wool Soft Spun. It lacks a bit of the fuzz the mohair provided but it has that loftiness making it a very lightweight sweater. The drape seems to be just as nice. Watch for this pattern soon. I have the pattern for this it's just one of those pieces that I'm not 100% sure of. I made one that I did put a zipper in and I love it. It's more a cape than a jacket since the sleeves don't separate from the body near the armpit but right above the garter stitch border. 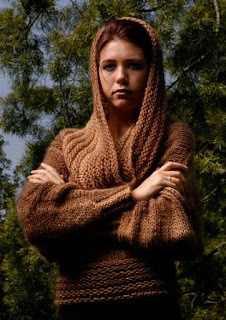 I get many compliments on it, it's an easy knit and it looks good on a lot of body types. What's my problem?! If third time's a charm I think I need to make one more to be sure. Thanks to the hubby for taking photos, to my friend Skye for stepping in for the photos and my dear Herman for letting me use his gorgeous yard for the location. Wow! Great entry and great pics yet again! Love the vest! Actually, all of these are beautiful patterns, Karen. Kudos. Oh please let me know when this pattern will be available (sweater in bulky yarn, with big sleeves and one button closure at neck). It is gorgeous!!! I MUST HAVE IT!!!! I have a blog here, thenappyewe.blogspot.com. Just let me know when. Wow, you are blessed with talent!!! 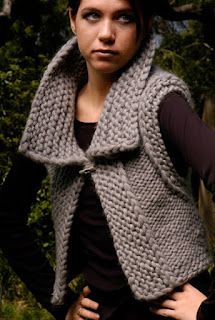 Hope the vest is one of the patterns you're planning to translate ... love it and already have the yarn waiting. Thanks! I'm hoping to have the vest pattern available in October so save that yarn! I want all of those patterns! Every one of them is unique & beautiful in its on way! Love it! Thanks for the kind words Mary! Any update on your target release for the vest and jacket? I haven't forgotten you sgreene! I have this one last pattern I'm trying to post which might be as soon as tomorrow and then the vest! Check back the end of next week for the vest and probably a week later for the jacket. Thanks for checking in!